D. J. Taylor, an English writer, is very popular with American critics. 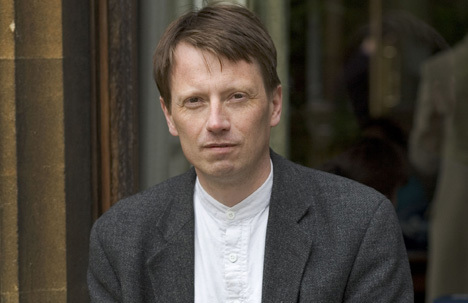 He was a finalist for the Man Booker Prize for his 2011 novel, Derby Day. He also won the 2003 Whitbread Biography Award for his biography of George Orwell. 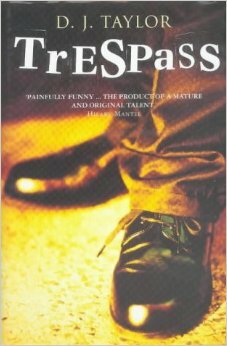 I just finished Taylor’s brilliant 1999 novel, Trespass, which is set in the 1950s through the ’70s, and tells the story of the rise and fall of George Chell, the hero and narrator. Or is he the hero? He has lived “a vagrant life” since his eccentric uncle’s financial crash six years ago. He is, with the help of a freelance writer, writing a book about his uncle, who died shortly after the collapse of his financial empire. As he muses on his uncle’s past, he also analyzes his own rise from working-class Norwich to the City in London to the financial crash. The past and present chapters alternate, usually with a Q&A chapter between. George’s sense of place is vivid: place defines his struggles with the English class system (about which I am certainly not qualified to write). During his childhood in West Earlham, his single mother, suspicious of church, school, and most of their neighbors, hates to dole out money for gym shoes, believes that charitable societies are a racket, and thinks tinned salmon is the thing to serve to her friends at high tea: crab is ostentatious, and frankfurters are simply low-class. His mother, who, George tells us, has no sense of narrative, will tell George nothing about his father until he reads a sentimental novel and asks her when “Father” will return. (She says he’s dead.) She has nothing to say about his uncle, either. His life changes dramatically when his uncle, a former toy salesman, becomes a City tycoon through a complicated financial scheme and takes George under his wing. George doesn’t quite understand the scheme, nor does anyone else. His funny, charming uncle is faintly reminiscent of chacracters in H. G. Wells’ comedies about class and money. George lives very high for a while. He is briefly entangled with the very upper-class Helena, a lovely, rich ditz, who is very, very funny. Later, after the crash, he befriends the freelance writer, Frances, who helps him with the book: an eccentric, well-educated woman, she conducts many interviews on the phone, reads books about Iris Murdoch, and is obsessed with Mr. Archer, the strange owner of the hotel. But romance is not a possibility. It is a stunning, very dark, often comical, novel about “trespassing” in different strata of society. Taylor’s style reminds me of Anthony Powell’s, laced with H. G. Wells. P.S. In recent months, I have blogged about four of Taylor’s brilliant novels, The Windsor Faction, a counterfactual history about what might have happened in World War II if Edward VIII had not abdicated the throne in the 1930s; Derby Day, a historical novel about the Epsom Derby; Kept, a kind of prequel to Derby Day; and Ask Alice, the story of a Midwesterner who runs away to England and becomes an actress and society hostess. Taylor is an eclectic writer: his style is flawless, and it changes with genre; he can write Victorian English in his pseudo-Victorian novels, or lucid contemporary English. This entry was tagged D. J. Taylor, Trespass. Bookmark the permalink. Sounds enjoyable. Have you read John Lanchester’s Capital? Taylor’s novel is brilliant. It’s on my highly recommended list, which reminds me, I should put the picture of it up on my sidebar. No, I haven’t read Lanchester’s, but I know his nonfiction.